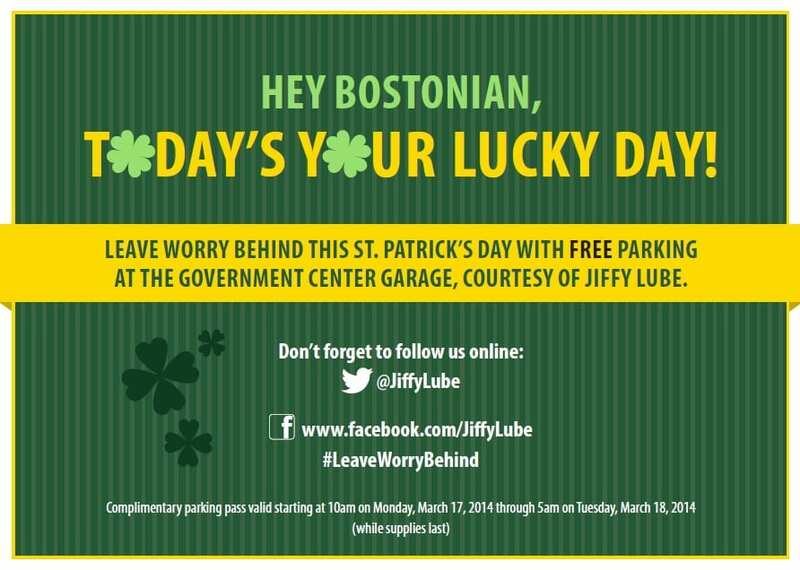 Free Parking at Government Center Garage Today Thanks to Jiffy Lube! Feeling lucky? Pull into the Government Center Garage starting at 10am today, March 17th, 2014, and the first 100 people will get free parking courtesy of Jiffy Lube! Entrances at 50 New Sudbury Street (faces Government Center/City Hill Plaza) and 24 New Chardon Street (faces the new Edward W. Brooke courthouse and the West End). Follow Jiffy Lube on Twitter or Facebook for more information and/or questions! Good Luck! FYI – it is free street parking today in Boston as well. Thanks for the reminder Maria!